Where? Sport11 Sports hall / Fitness 1112 Budapest Kánai út 2. We would recomment it to all trainers and pesonal trainers who work to improve the strength of their students and for those who finally want to see real results. It is also for personal or recreational trainers who have group classes and would like to introduce some changes for variety. Those who already use a wide array of tools will be glad to have one more idea to mix and combine different forms of exercise for different functions. With DBands you will have a lot of fun with the new possibilities, whether it is an individual session or a group class. 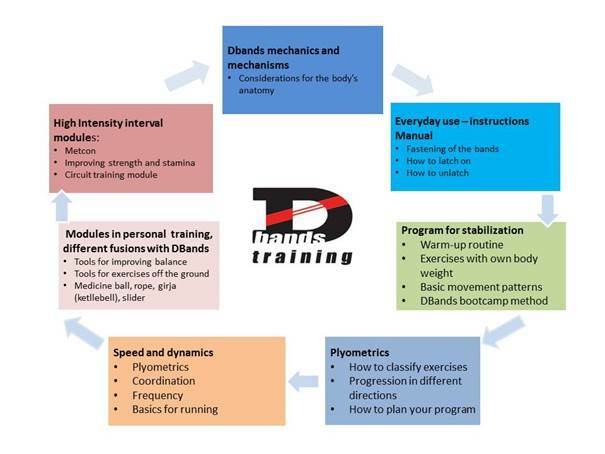 DBands meaning Dynamic Bands is a latest generation development of flexible tools which has become widespread in recent years in all sports where it is vitally important to develop motor functions. It is a great tool meant to develop stability, strength, speed and stamina. It consists of two strips of rubber that you can attach above your knees, one in the front and one in the back. You have to override the resistance of the rubber by using all the power of your legs and the hip area. It is a revolutionary new method of building strength, speed and stamina as well as shaping the muscles. how to adapt its benefits to different other sports? When you attend the course you will get a free DBands Tshirt and you will have a DBands tool for your use during the course. At the end of the course you can buy it with a 20 % discount. Sport11 Sports hall / Fitness 1112 Budapest Kánai út 2.